Next Generation Business Intelligence – what is your data telling you? 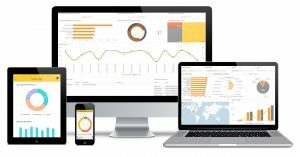 Your business is generating data all of the time, and if you know what to do with it, how to analyse it, it can provide valuable insights that help you to make the right decisions for your business. Traditionally, it would take an employees hours to compile the relevant data from multiple different business systems to produce one report, often having to second guess what questions might be asked and include extra data ‘just in case’. None of which is the best use of anyone’s time. And by the time the report is presented, you’re looking at data that could be hours, even days old. In a fast paced business environment, if you need to produce a variety of reports, quickly and easily, using the most up to date data, a Next Generation Business Intelligence solution could be the answer! Next Generation BI can transform the way you work with your data, allowing you to easily combine, analyse and explore live data from multiple sources. We understand that some businesses won’t have any BI reporting and will rely on the pre-written reports that come with their in house business systems. Some businesses will have BI reporting, understand it usefulness but struggle to get the most out of it. That’s where YourDMS can help. We simplify and manage the entire ‘knowledge’ process, taking complex data and instantly creating insights that drive your business. Users can view and explore their data via an interactive dashboard, creating reports at the click of a button. Next Generation BI allows you to easily interrogate your live data in a few clicks. If you want to report on something new, click and it’s done. It gives you the flexibility to create and share reports that show you the information you need, when you need it. You can see instantly what areas of the business are doing well, and identify activities that could be increased or replicated; and also what’s not working and needs to be addressed. With live reporting and insights, your business can adapt and respond to changes and challenges quickly! Get in touch to find out how YourDMS can simplify and manage your Business Intelligence processes, ensuring that you always have easy access to the latest data.